Ok, schools in session, and this student is wanting to be educated. 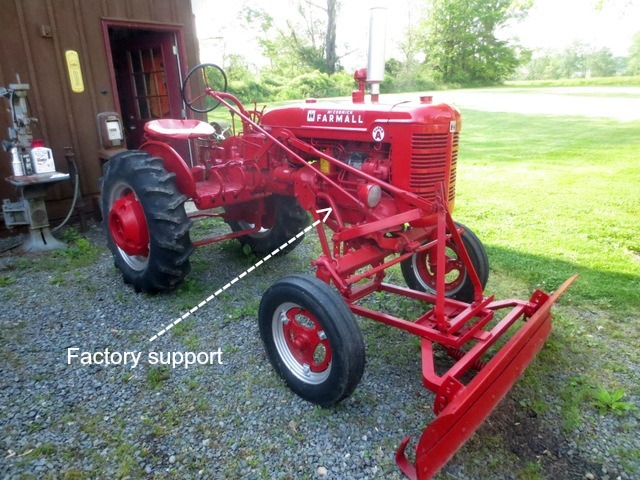 Below are two plow setups presumably both for a Farmall A, Super or early (non hydraulic) though they are not specific. I see two differences in how they are connected to the boomerang on the rockshaft. The red plow connects with a rod coming straight back accross the top pulling to lift while the rusty plow drops down like my LO-Boy pushing the lever to lift the plow. I might guess that the red plow was used for a Super A and maybe the rusty could be for and early A (?). Which would be considered correct to use with an early A for use with a hand lift? Will both designs bolt up under an early A or are there differences from how a Super A mounts a plow? Of course my interest in this is for use on my 1946 A. I also figured I'm not the only person that would want to expand his / her tractor knowledge. I have very limited experience With A/Super A blades, but what is the width of the blade? The cub which is what the bottom one looks like is 54", while the A/SA would be 60". The Farmall A did not have a universal hand lift like the Cub. Every implement had its own custom hand lift that had to be installed along with the implement. IH made many changes with regards to the mounting pads between the A and Super A. At the very least the final drive mounting is completely different so implements are not compatible between the tractors. I haven't done an in-depth analysis, but I would not be surprised of the torque tube mounting pads are different also, along with the front end mounting. With that information, I think the answer is probably "none of the above." The red plow is definitely for a Super A. 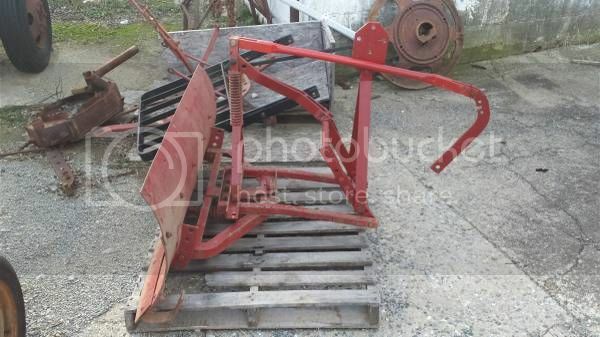 Even if the rusty plow originally fit an A, it's missing a couple of key mounting brackets and the hand lift mechanism. John and Matt are both on the right track. The red one looks like a Super A through 140 blade, substantially (if not totally) complete for front mount. Missing the substitute drawbar for belly mount. It looks like the push frame is bent. It will bolt onto an A. To use it hand lift requires a specific rockshaft and lever assembly. The long rod that connects to the boomerang is a different length for the hand lift. 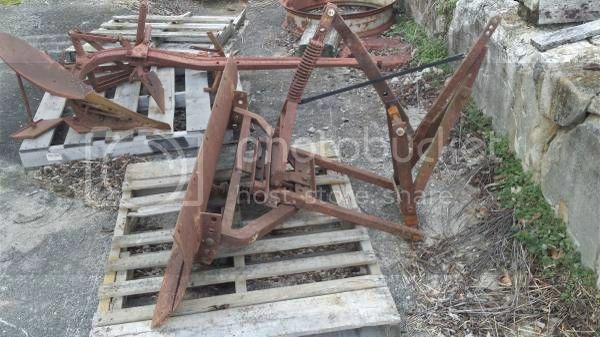 The rusty one looks like a Super A push frame and blade attached to Cub mounting and lift parts. There was an earlier version of the Super A blade but it didn't look like this. If the plow will bolt to the front of an A, then all is not lost. From there it's just a matter of ingenuity and steel to adapt one of the many hand lift options to the blade. Matt Kirsch wrote: If the plow will bolt to the front of an A, then all is not lost. From there it's just a matter of ingenuity and steel to adapt one of the many hand lift options to the blade. Yes exactly. There are certain parts I can fabricate which seems to have been the option for those first owners back in the late '40s that had a non hydraulic tractor. These two blades are being sold by the same seller as for a Farmall A. As I said the rusted one looks a lot like the one on my Cub Lo-Boy. I wasn't sure then but it wouldn't surprize me if it had a few borrowed parts from a cub. I'm a good three and a half hour drive from these so I couldn't just run over for a look. I also couldn't buy them at the moment anyway but I did save the contact number. Come spring when my side jobs kick in and provide me a little extra cash I'll give him a call to see if they are still there. It'll be off season and make it easier to haggle. With all your input I will have a much better idea of what I'm looking for and what to avoid. On the red plow I wasn't sure of what I was looking at Jim but yes it does look bent. I could fix that without too much trouble though. At this point if was to make a choice I'd probably be safest with the red plow. In the mean time we'll see what else pops up. This old dog is trying his best to learn. On another note, with another hand lift lead and the bulkiness of it making shipping a pain I will probably make it easier and scoop it up at the Virginia Cub Fest in April. Yup, I'm in the process of talking myself into going and it looks like my wife will be joining me. Haven't attended one before and I think its about time. I am looking forward to finally meeting some of the good folks that I have been corresponding with here for years. My 1945 had the factory plow on it along with the factory hand lift assembly. The blade is now on my Farmall 100 but the hand lever assembly is still on my A lifting the woods L-306 mower deck. I can send pictures of the hand lever assembly if you like? The only difference between the blades from a A-140 is that the A doesn't use the boomerang and requires a different hand lift assembly. when I put the blade on my 100 I didn't use the boomerang it still worked. I added the boomerang a year or so later. I think I could send pics of the blade hooked to the Farmall A how it sat when I hauled it home! For what it is worth, here is how the 60 looks mounted to a Super A with Industrial axle. cjpenny89 wrote: My 1945 had the factory plow on it along with the factory hand lift assembly. The blade is now on my Farmall 100 but the hand lever assembly is still on my A lifting the woods L-306 mower deck. I can send pictures of the hand lever assembly if you like? Yes, I'd really like to see that thank you! EZ wrote: For what it is worth, here is how the 60 looks mounted to a Super A with Industrial axle. Mine has the square axle as well. Thank you! I also have a plan B. This past winter I watched my buddy plow his driveway with his quad. It used a small winch to raise and lower the plow. I don't see how it couldn't work on the tractor to do the same. If I can't get the hand lift to work or find it to tough to lift the plow by hand I can weld up a mount to bolt to the tractor and hold the winch. Just yesterday I took advantage of a sale at Harbor Frieght and bought a 2500 lb. winch with 50' of cable for $56. I've been wanting it for a while to use when the tractor gets stuck back in the woods. I've been using a come-along which works but the winch will be better. So either way I'll get use out of it. Now later this summer I'll reach back out to a few people who had plows for sale at top dollar this past winter and see if I can get a deal. PS- thanks to Eugene's help I've gotten my Lo-Boy running strong again. That has a complete plow setup on it. So now that the snow is all but done I'm ready for it.